Note: This meet is only open to middle school and high school orienteers, and participants at the JROTC Leadership Camp. 11:30 am to 12:00 pm Check-in / registration. 12:00 pm - 1:00 pm Interval starts. - Our standard CSOL meet fee will apply: $10 per student (includes one map and one e-punch rental). Or, $8 for any runners who have their own e-punch finger stick. - We accept cash, checks payable to "RMOC", and credit card payments via PayPal if you submit our "Request for Invoice" form. Contact Brooke Mann (Registrar) if you have payment questions. Pre-Registration: Pre-registration is required for this meet. The pre-registration deadline is noon on Tuesday, June 5th. - To register an individual runner, use the form at the bottom of this web page. Volunteers: Please contact RMOC President Doug Berling if you can volunteer at this meet: email. We can use help with set-up, registration, starts, e-punch timing, and (especially) control pick-up. Location: This meet will take place at Peaceful Valley Scout Ranch's Magness facility on the west side of Elbert Road. See map and driving directions below. Registration / check-in, download, and awards will be at the Eagle's Nest building northwest of the lake (the same building we've used in previous years). · From the North (Denver or Castle Rock): Take I-25 south to the Founders Parkway exit in Castle Rock. Follow Founder's Parkway east and then south to Highway 86. Go east on Highway 86 for ~20 miles, through the towns of Franktown and Elizabeth. Just as you approach the town of Kiowa, turn right (south) onto Elbert Road. Continue on Elbert Road for approximately 12 miles until you reach Peaceful Valley Scout Ranch. Look for signs on the east side of the road for the main Scout Ranch, or on the west side for the Magness facility. Note #1: A more direct route is to take Road 17 south out of Elizabeth, Road 106 east to Elbert, and then Elbert Road south to Peaceful Valley. Road 17 and Road 106 have sparse signage, so use this route at your own risk. · From the Northern Side of Colorado Springs: From I-25, take the exit for Interquest Parkway. Go east on Interquest and it will become Highway 83 heading north. Go north on Highway 83 for eight miles to Hodgen Road. Turn right and go eight miles to Eastonville Road. Turn right and go a short distance south to Sweet Road. Turn left onto Sweet Road and go approximately two miles to Elbert Road. Turn left and go 13 miles north on Elbert Road to Peaceful Valley Scout Ranch. Look for signs on the east side of the road for the main Scout Ranch, or on the west side for the Magness facility. · From Central Colorado Springs: From I-25, take Highway 24 northeast to Elbert Road. Take Elbert Road north for approximately 20 miles until you reach Peaceful Valley Scout Ranch. Look for signs on the east side of the road for the main Scout Ranch, or on the west side for the Magness facility. 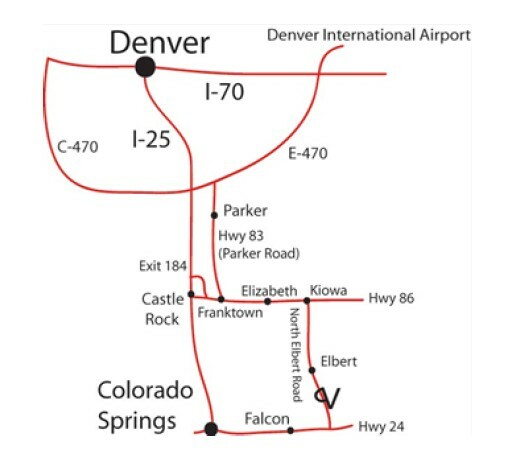 · From the East Side of Colorado Springs: From the junction of Highways 24 and 94 north of the Colorado Springs Airport, go east on Highway 24 for 13.6 miles through Falcon to Elbert Road (barely marked with a small green sign). Turn left onto Elbert Road and continue north for approximately 20 miles to Peaceful Valley Scout Ranch. Look for signs on the east side of the road for the main Scout Ranch, or on the west side for the Magness facility.